The Fleetwoods were one of America's most popular doo-wop groups in the late '50s. 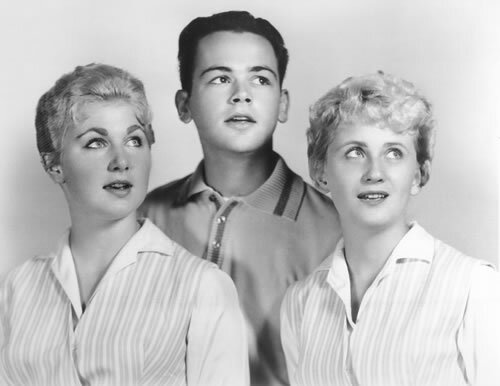 The original members of the group, Gary Troxel, Gretchen Christopher, and Barbara Ellis, met when they were seniors at Olympia High School in Olympia, Washington. Originally a female duo, they initially recruited Gary to play trumpet. The girls had composed a song while, independently, Gary had written a hook that went “n-do-be-do dum dum-dum do dum.” They put them together and Come Softly To Me was born. Rock & Blues News told The Fleetwoods’ story in 1999. Read The Fleetwoods - then and now. Chart fame was instant for the distinctive trio and the haunting and catchy song (on which the vocal was recorded a cappella) shot to the top in the U.S. charts. Mr. Blue, a Dewayne Blackwell song originally written for the Platters, was also number 1 and made Gary one of the leaders in the teen idol stakes. In the midst of their success he had to serve 2 years active duty in the Navy, his place being taken when necessary by later solo star Vic Dana. Despite Gary's absence, the hits continued and they totaled nine Top 40 hits between 1959 and 1963 and included the number 10 hit Tragedy, a revival of the Thomas Wayne song. The Fleetwoods performed a few “oldies” revival shows in the early 1970’s. When Gretchen decided she wanted to stay home and be a wife and mother, Barbara and Gary did a couple of shows together and re-recorded their hits for K-Tel records. In the early 1980’s Gary teamed up again with Gretchen and replacement Cheryl Huggins. 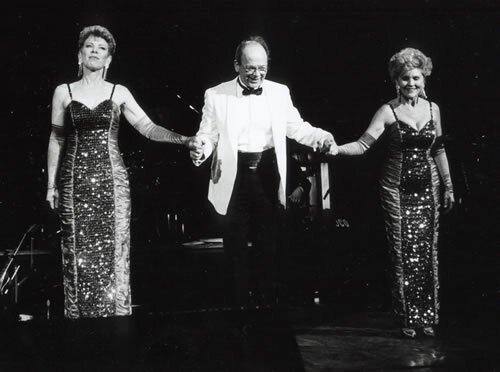 They performed together until 1985. In 1987/1988 Gary and Cheryl performed as The Fleetwoods with Candy Johnson of Missoula, Montana. In 1989, Bonnie Hannukaine joined with Gary and Cheryl to make up the group as they appear today. They perform regularly at “oldies” concerts, special private functions and class reunions. Gary says that both Cheryl and Bonnie are able to do the close harmony and sound just like Barbara and Gretchen. In 1997, Gary, Cheryl and Bonnie recorded Little Altar Boy for the Street Carols December Voices CD. Barbara is retired from performing. Gretchen continues to perform as a solist as Gretchen Christopher of The Fleetwoods. Cheryl Huggins grew up in Montana and moved to Olympia, Washington in 1978. She has two children and four grandchildren. She retired from the state of Washington. She had worked for several agencies. Her husband is a retired Credit Union CEO. Bonnie Hannukaine grew up in Aberdeen, Washington. She has three children and three grandsons. Bonnie and her husband met at Grays Harbor Community College. They own and operate a sign business in Olympia, Washington. To book The Fleetwoods, jump to the Contact Us page.